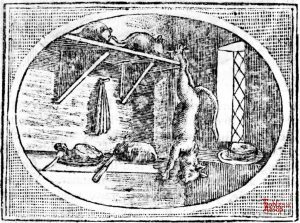 A cat came to a house with mice and started to feast. 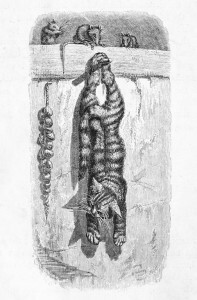 The mice hid and the cat, thinking to fool them, hung itself from a peg as a bag. Didn’t work. Do not put yourself at the mercy of a known enemy. If you are wise you won’t be deceived by the innocent airs of those whom you have once found to be dangerous. The wise do not let themselves be tricked a second time. 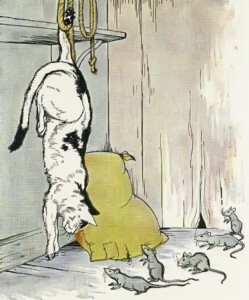 A CERTAIN house was much infested with Mice; but at last they got a Cat, who catched and ate every day some of them. 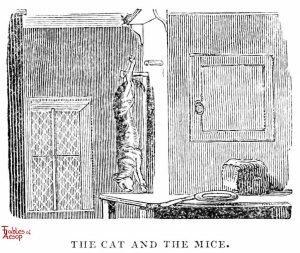 The Mice, finding their numbers grow thin, consulted what was best to be done for the preservation of the public, from the jaws of the devouring Cat. They debated, and came to this resolution, that no one should go down below the upper shelf. 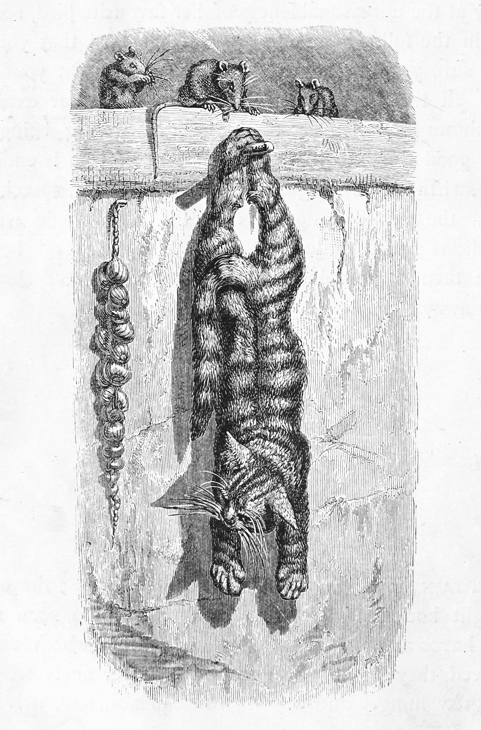 The Cat, observing the Mice no longer came down, as usual, hungry, and disappointed of her prey, had recourse to this stratagem; she hung by her hinder legs on a peg which stuck in the wall, and made as if she had been dead, hoping by this lure to entice the Mice to come down. 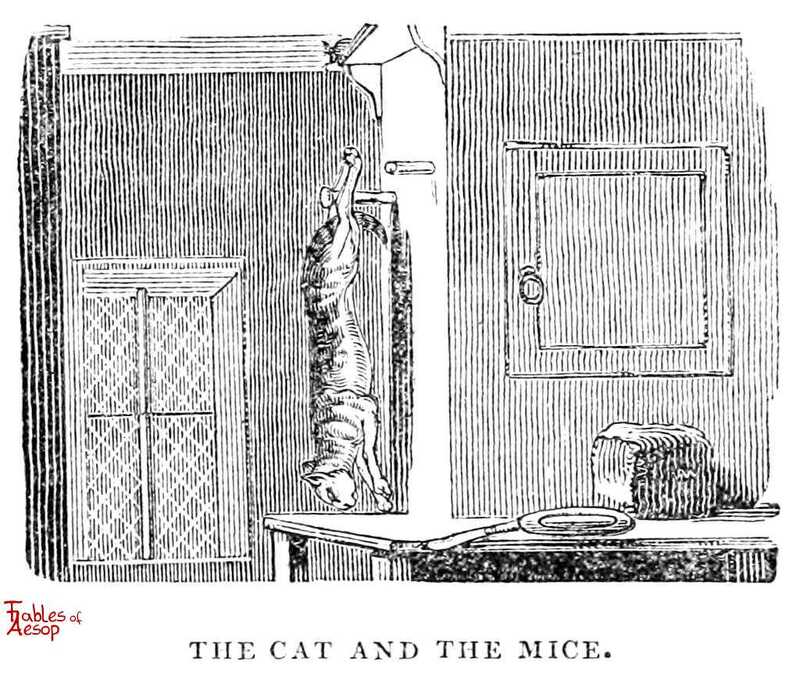 She had not been in this posture long, before a cunning old Mouse peeped over the edge of the shelf, and spoke thus: Aha, my good friend, are you there? there you may be! I would not trust myself with you, though your skin were stuffed with straw. Prudent folks never trust those a second time, who have deceived them once. And, indeed, we cannot well be too cautious in following this rule; for, upon examination, we shall find, that most of the misfortunes which befal us, proceed from our too great credulity. They that know how to suspect, without exposing or hurting themselves, till honesty comes to be more fashion, can never suspect too much. 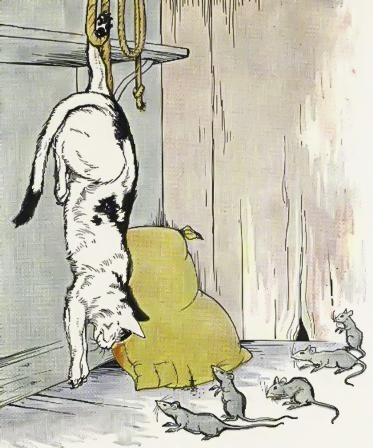 There was a house mightily troubled with mice, and a notable cat there was, that time after time had pick’d up so many of ’em, that they agreed among themselves to keep above in the cieling; for they found that upon the plain floor there was no living for ’em. This spoil’d pusses sport, unless she could find a way to trepan them down again. So she leapt up to a pin that was driven into the wall, and there hung like a polcat in a warren, to amuse them. 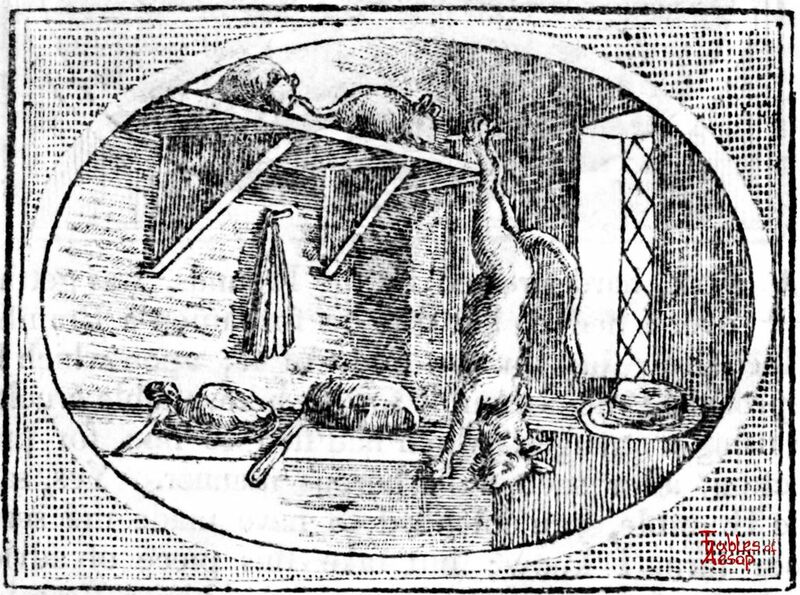 The mice took notice of it, and one wiser then the rest stretched out his neck to learn the truth of the matter, and so soon as ever he found how ’twas, Ah, says he, you may hang there ’till your heart akes; for if you were but a dish-clout, as you are a counterfeiting devil of a cat, here’s not a creature will come near ye. Let no man lay himself at the mercy of a known enemy, under any shew, or pretence whatsoever; for he forfeits his discretion, even though he should happen to save his carcass, and his fortune.